Firepower Records, the feral child of dubstep giant, Datsik, defends its title as one of the heaviest labels in the business with a new release of its first 13-track LP showcasing the best of the best. Each of the 13 artists on the label bring the expert broad strokes that make a masterpiece of a first collective release, Shell Shock (Volume 1). The Frim kicks off the party with his womp-ridden track, “Bassline Skanka.” A beat this heavy brought in by a Decepticon soundalike crash-lands the listener into sinister territory. The LP keeps up the ruthless pace until it breaks on the intro of Datsik‘s “Juicebox,” which combines the light melodic tones of the piano and violin with a hip-hop beat. The track hooks you in right away, but in case you don’t recognize the man behind the curtain, you’ll nod your head as the track moves into Datsik’s signature washboard bass sound, accompanied by enough wobble bass to satisfy any dub head. Following a different approach, Sub-Antix‘s 808-ridden VIP mix of “80 Weight” brings the rhetorical, “Damn son, where’d ya find this?” followed by an eerie, synth echo on top of a hip-hop drum beat, creating an anthem-worthy trap remix. The Protohype and ETC!ETC! track, “Bad Boy Flow,” begins with a crazy tribal drum beat that quickly ignites into an addictive moombahton beat. Throughout, the track is accompanied by the vocals which consist only of the words “Bad boy flow,” reminiscent of GTA‘s “Booty Bounce” but wholly original in its ability to surpass the latter’s crazy energy and beat. Barron, a relatively small name in the industry, is a standout on this collective effort. His take on drumstep with the track “Full Throttle” went, well, full throttle. The high energy and grimy basslines bring to mind favorite drumstep producers like Figure and xKore. 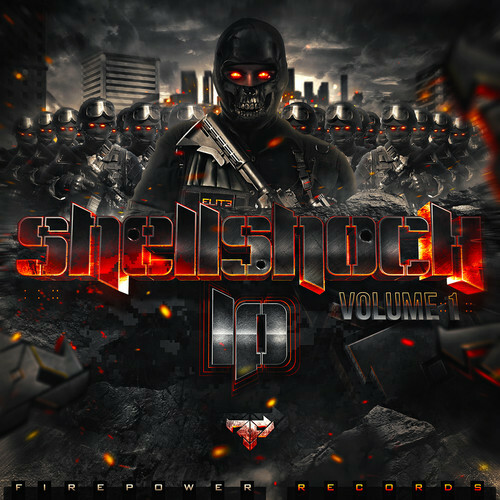 Firepower features some of the hardest hitting artists in the electronic music business today, and Shell Shock (Volume 1) showcases some of their best work to date. The LP as a whole takes an expert snapshot of the continually changing landscape of electronic music, bringing together a variety of sub-genres and new sounds that tell us Firepower is just coming out of the chamber.